As you may have heard, the ship The Estelle, sailing in international waters, was illegally boarded by the Israeli navy, and its occupants taken into custody. Among those being held are Jim Manley, a Canadian, and a former New Democrat MP. The Estelle is part of the Freedom Flotilla movement, which seeks to draw attention to the illegal blockade of Gaza, to stand in solidarity with the people of Palestine, and to bring humanitarian aid to Gaza. The 30 activists on board The Estelle hailed from Israel, the US, Canada, Israel, Norway, and Sweden. In a story about the incident, the Calgary Herald describes Gaza as "the seaside strip ruled by the Islamic militant Hamas group". This "seaside strip" is home to 1.7 million people, and Hamas is recognized by those people as their legitimate government. Of course, Hamas is an officially designated terrorist organization as defined by the US, Israel, and the EU, and since Canada takes its marching orders from the US, by Canada as well. According to much of the world, including many citizens of those same countries, that is one very large, powerful pot name-calling a small, freedom-fighting kettle. Labelling Hamas a terrorist group allows Israel to engage in all manner of repression, destruction, torture, and murder. Elsewhere, that same label provides a cover for suppressing free speech and freedom of assembly. For example, that official terrorist designation gave Jason Kenney's office an excuse to bar the British activist and (then former) MP George Galloway from Canada. The Canadian courts correctly reversed that decision. Examples of this censorship are everywhere. The City of Toronto wants to change its anti-discrimination policies so that the words "Israeli apartheid" will be a violation of rights. So calling Hamas a terrorist organization is not an insult to Palestinians, but calling Israel an apartheid state is discrimination against... who exactly? No one. The boycott-divest-sanction movement and the mere words "Israeli apartheid" are instantly and constantly equated with anti-Semitism, often by people who equate everything Muslim with terrorism. At this point, the knee-jerk reaction is so swift and shallow, it's become almost comical. Write something defending Palestinian autonomy human rights, get labelled an anti-Semite. It's amazing how everyone cares so much about Jews all of a sudden. Too bad Canada and the US didn't care when it really mattered. More on the Toronto so-called anti-discrimination policy in a future post. bill ayers: "as public space contracts, the real victim becomes truth, honesty, integrity, curiosity, imagination, freedom"
A while back in my Intellectual Freedom and the Public Library course, I encountered an interesting shift of ideas. Larry Alexander, while arguing that freedom of expression is not a human right (I disagree! ), points out that free speech is less about the right of the speaker, than the rights of potential listeners. Alexander uses the example of a government banning the works of Karl Marx. Marx himself is dead, so his rights cannot be infringed on; if Marx is banned, our opportunity to encounter his ideas - and so, our own freedom of expression - are being denied. This was the central issue in Canada's refusal to allow George Galloway entry into the country. Galloway is not a Canadian citizen, so his Charter rights were not being infringed, but ours were. Canadians have - or are supposed to have, anyway - rights of freedom of association and expression. We have a right to see, meet and hear anyone we choose, and if those people pose no threat to the security of the country, we have a right to do so in our own towns and cities. And this right should not be contingent on our agreement with the political views of the sitting government. In January this year, I was invited by the Ontario Confederation of University Faculty Associations (OCUFA) to address the Worldviews Conference on Media and Higher Education to be held on 16 June 2011 in Toronto. The topic would be "The responsibility of academics to contribute to public debates in the media." I told the organisers then that while I would love to attend, I had been denied entry into Canada twice in the past few years – once in Calgary, and later at Island Airport – and that while lawyers on both sides of the border were engaging the issue, we were being met again and again by bureaucratic gibberish and classic rule-by-no-one. The president of OCUFA sent a letter to the Canada Border Services Agency hoping to resolve the matter, and received a boiler-plate response: "The CBSA is charged to ensure the security and prosperity of Canada by managing access of people and goods." I explained that my participation in the conference would jeopardise neither, and promised to spend a lot of money while in town, but I got the same response. I'm in Chicago today, and a video of my talk has been sent to the conference. One irony in this situation is that the injured party in all of this is not me primarily, but the people who, for whatever reason, wanted to engage me in conversation. After all, I will talk to myself all day, and probably disagree and argue with myself as usual. But what of the Canadians who thought it might be useful to have a dialogue? Tough luck: your government is vigilantly watching over your security and prosperity. There's another irony, of course, in the government preventing me from exercising the very responsibility I was invited to address. This is a basic issue of free and open debate and the democratic exchange of ideas – not one of a potential threat to the nation's security. The technical issue here is that the border guard who turned me back in Calgary said that, according his computer, I had quite a lengthy arrest record. True, I said, arrests from sit-ins, occupations, and antiwar activities 40 years ago, and all misdemeanours. Well, he responded, you have one felony conviction, and that's why you will not get into Canada today. But I don't have any felony convictions. Prove that you don't have any, he said. Years and a lot of lawyer's fees later, I'm still having trouble disproving a negative, if you get the Catch-22 here. . . but wait! I just realised that some of those fees are, indeed, contributing to the prosperity of Canada! OK, I'll stay out. I entered Canada a dozen times in the preceding decade – taking my kids to the Shakespeare or skiing in Banff, attending research conferences, speaking at universities – and have been to scores of other countries from Cyprus to China, Hong Kong to Beirut, the Netherlands to Chile. But perhaps those countries lack the thorough security sense of Canada. As the public space contracts, the real victim becomes truth, honesty, integrity, curiosity, imagination, freedom itself. Read it here: Can Canada really be scared of free-thinking? Outspoken former British MP George Galloway has made good on his threat to sue Canada's immigration minister. A statement of claim served on Jason Kenney and his assistant Alykhan Velshi alleges they abused their official powers by banning Galloway from Canada in 2009. The document, which asks for $1.5 million in damages, also claims that Kenney and Velshi defamed Galloway in British newspapers. Galloway, an outspoken supporter of the Palestinian people, had been planning to stage a cross-country speaking tour about the wars in Iraq and Afghanistan. Kenney barred him from the country for his alleged financial support to the Palestinian group Hamas, which Ottawa considers a terrorist organization. A lawyer representing Galloway says the former MP will argue that the allegations of terrorism lost him his long-held seat in the British House of Commons. This Canadian Press story doesn't say that Galloway has repeatedly pledged to donate any judgment from this suit to the anti-war movement in Canada. Seems like that's an important detail to omit. I attended the court hearing challenging Galloway's inadmission to Canada; my notes on it are here: part 1, part 2, part 3, and court documents. Two weeks ago, at Toronto's Trinity St. Paul Centre, George Galloway spoke about the grassroots revolutions in the Arab world, and the intervention or interference of Western nations. I couldn't be there, so I'm grateful for YouTube and activists with video cameras. The whole talk is about 26 minutes (parts 1 and 2), and well worth your time. In parts 3, 4, and 5, Galloway responds to some hecklers with his usual arsenal of facts, wit and aplomb. And for a bonus, courtesy of Allan, there is Galloway discussing Libya on the UK's Sky News on March 19.
george galloway: "à bient?t, canada. we will hold your crooked government to account." George Galloway, on the close of his 12-city, ban-busting tour of Canada. He'll be back! galloway vs. kenney and harper, part three: "what's wrong with this parliament?" Political firebrand George Galloway took his message straight into the heart of Alberta's conservative country Tuesday evening and into the city represented in part by the man who earlier blocked his entry into Canada. The former British MP -- once a member of the Labour Party and more recently a founder of the left-wing Respect Party -- spoke to more than 750 people who braved the -28 C temperature to take in his speech at the University of Calgary. His current speaking tour of Canada replaces the one he had planned for last year when he was denied entry into the country over his alleged financial support of the Palestinian group Hamas. Ottawa considers Hamas a terrorist organization. Immigration officials later let Galloway into the country following a Federal Court ruling that was critical of the government, saying its decision to keep him out was in part politically motivated. "I'm astounded at this turnout on this bitter winter's evening. I thought I wasn't welcome in Calgary. Practically the only seat vacant in this hall is the one that we kept for the local member of Parliament," he said to loud applause. Two seats were noticeably empty. They had been set aside for federal Immigration Minister Jason Kenney, the MP for Calgary Southeast, and a guest. "I visited his constituency office today. He hadn't even cleared the snow and ice from the front of it. I don't know how he gets such a big vote," Galloway joked. "I went there looking for him. I'm looking for him everywhere. He doesn't answer my calls, he doesn't reply to my letters and today he wasn't there. "When he banned me 18 months ago, Mr. Kenney's office said `he's not getting in and that is that.' I said it ain't over until the fat lady sings and the fat lady in question is the grand old lady of Canadian justice." Earlier this year in Toronto, Galloway donned a pair of red mittens as if they were boxing gloves, challenged Kenney to a public debate and promised to sue the minister for slander. On Tuesday, Galloway didn't limit his barbs to Kenney. He also took shots at Prime Minister Stephen Harper and the opposition leaders over word that Canada was extending its mission to Afghanistan by another three years. "I see that your government has broken yet another promise," Galloway said. "They've promised they would withdraw your young soldiers from this doomed and disastrous war in Afghanistan. "What's wrong with this Parliament? You're paying an opposition to be the opposition but actually on such a momentus decision such as this continuing, your opposition doesn't even want a debate, never mind a vote." Galloway said Canadian taxpayers will lose more of their "tax dollars and the lifesblood of your young men" by continuing to participate in a war that has "gone so disastrously wrong." George Galloway, currently on a cross-country speaking tour in Canada, has pledged the proceeds of his lawsuit against the Canadian government to the Canadian peace movement. He's been announcing this in local and national Canadian media all over the country, and the news has been rocketing through the anti-war movement. Galloway's generosity and strength of commitment is so energizing for all of us who work for peace. Well, it’s all very mysterious. That’s the first point. The Canadian taxpayer paid a pretty penny for this conference, even though they were entirely locked out of it. No media were permitted in it. We have no proper record of who was there. The attendance list even has not been published despite the taxpayer funding the whole thing. And it’s all very mysterious – what it’s all about. And when we’ll see its impact on Canadian public life. But it would be a fair inference that its impact will be malign and that the current assault on free expression on this issue in Canada is going to be intensified as a result of these protocols. I don’t think that this kind of secret conclave, coming up with – until now — secret protocols – is going to combat any antisemitism in Canada. As a matter of fact, it’s quite likely to generate greater feelings of enmity, which of course, I would deplore. Antisemitism exists. It is a racist phenomenon that has long existed in Christian countries for many, many centuries. Like all forms of racism it must be combated, and combated in the correct way which successfully, hopefully, one day, extinguishes it. But the answer to antisemitism is not to stop beating up the Jews and start beating up the Muslims. Instead, the answer is to conduct oneself in an unrelenting campaign against all forms of racism, bigotry and hatred – and that’s what I have done all of my life. Insofar as I’ve seen anything from this secret conclave, it attempts something unique in the world – to make Israel the collective Jew. And this, itself, is a racist and therefore antisemitic idea. Israel is not the collective Jew. There is no collective Jew. There are huge numbers of Jews who don’t want anything to do with Israel either from religious or secular, progressive standpoints. The population of Israel is not Jewish. There are at least 25 per cent of the population which is not Jewish and no one has the right to collectivize them as Jewish – to do what Lieberman is demanding they do themselves – to sign an oath effectively liquidating their place in the state as first class citizens. And of course there are well over two and a half million – in fact, getting on for three million Christians and Muslims living under illegal occupation within the de facto borders of Israel today. And they too cannot be collectivized as Jews by the whim of a secret conclave in Ottawa. So I think it’s all rather disturbing. But it raises what we used to call the $64,000 question, which is: Why is Canada doing this? Why has Canada become this monomaniacal supporter of the most extreme forms of support for Israel? Why has Canada allowed itself to become effectively an embassy for Netanyahu in the world? It’s certainly not in Canada’s interest. I don’t believe it’s in the interests of the Jews of the world. And I don’t even believe it’s in the interests of the State of Israel. And it goes without saying it’s certainly not in the interests of the region as a whole and peace in the world. Independent Jewish Voices (Canada) also has an excellent response to this dangerous trend. Newcomers to wmtc may want to read this older post: "a simple lesson: how to tell the difference between hatred of a people and criticism of a nation's policies". Today, George Galloway's second Toronto appearance is sold out, but you can catch him tomorrow in Hamilton, then in Vancouver, Calgary, Yellowknife, Edmonton, Winnipeg and Ottawa. Calgary is going to be fun. Tour dates and ticket info here. George Galloway's "Free Palestine Free Afghanistan Free Speech" cross-Canadian tour kicks off today in Toronto. Galloway will be appearing in Toronto, Montreal, Halifax, then back to Toronto for a second date, then Hamilton, Vancouver, Calgary (that ought to be fun), Yellowknife, Edmonton, Winnipeg and Ottawa. If you haven't heard Galloway speak, it's a real treat. The full schedule is here. lawrence martin: "countless examples of the intolerant streak that marks this government"
In case you missed it, here's an excellent column by Lawrence Martin in the Globe and Mail from earlier this week. I'm pleased to note it bears a strong resemblance to something I recently wrote. I'm even more pleased to see Martin's prominent reference to US war resisters seeking refuge in Canada. Canadians have gained a reputation as a fair-minded people. There have been exceptions through our history, but, by and large, we have been seen as a moderate and tolerant country. We didn’t do guilt by association, for example. But that’s what so distressing about the character of today’s Conservatives. They revel in it. The most recent manifestation is the cancellation of a speech by the head of the Canadian Islamic Congress at the National Defence Headquarters. Many years ago, a former director of the group made some remarks – vile remarks – about Israelis over the age of 18 being legitimate targets for suicide bombers. By all accounts, new director Imam Zijad Delic repudiates that extremism. By all accounts, he is trying to bridge the divide. But the Conservatives tar him with the same brush and won’t allow him to give a speech at the National Defence Headquarters. Imagine the harm it would have done! There are countless examples of the intolerant streak that marks this government. Canada opposed the Iraq war, yet we won’t allow a haven to Americans who opposed fighting in that war, as we did with Vietnam. We’re probably the only G20 country that tried to bar George Galloway, at the time a British MP, from coming to speak. Minister of State Diane Ablonczy was stripped of some of her responsibilities for her support of Gay Pride week. Those criticizing aspects of our Afghanistan policy are berated for not supporting our troops. If a bank executive like Ed Clark criticizes government economic policy, he’s pilloried for supposedly being motivated by politics rather than economic expertise. I'm sure most Canadian wmtc readers are planning to read Martin's new book, Harperland, if you haven't read it already. It's the first book on my winter-break non-school reading list. I wish I could tell you everything George Galloway said in Toronto yesterday, because I'm sure it was an inspiring, energizing, truth-telling and sobering talk. I wasn't able to stay for most of it, because Sunday is a work day for me. But by rearranging all my break time for the weekend, I was able to run up to Trinity St. Paul's United Church, spend an hour with my resister-campaign family, be part of the triumphant scene to cheer Galloway on, hear some important words, and run back to work. You'll be able to see Galloway's talk on Rabble TV, but I'll share a few cool things I did catch. The church was packed to the rafters. War resisters and Galloway's legal team held places of honour on the stage. An organizer began a chant of "Kenney out! Galloway in!" but when Galloway - and his volunteer bodyguards - entered, we all jumped up and broke into wild cheers and applause. James Clark, a lead organizer with Toronto Coalition to Stop the War and Defend Free Speech, and one of the applicants in the lawsuit, chaired the event. James was interrupted over and over by jubilant applause and cheering, as he outlined how the Harper Government and Jason Kenney tried to stop George Galloway's appearance in Canada - but how they couldn't stop us, how thousands of us watched Galloway address us by video - how Kenney attacked Galloway, smeared him, slandered him - then gloated and bragged about keeping Galloway out of Canada. But, James said, our side won "a massive victory in the Federal Court of Canada," and now we must use that victory as a new beginning, to turn the tide against the Tories, to push back against their attacks on free speech, democracy and all our struggles: "Today is a victory, but it is only a first step. Jason Kenney must pay for lying to the public" and for making Canada look like a banana republic! Next the two lawyers who defended the Galloway case in Federal Court spoke. They made it very clear just how big a victory this was for our side. Jason Kenney lost throughout: George Galloway was cleared of any wrongdoing, the court found that Kenney acted in bad faith, that the government declared Galloway inadmissible to Canada because they disagree with his political views, and that humanitarian aid is not equivalent to terrorism. Immigration and refugee lawyer Barbara Jackman spoke briefly and eloquently on a few points that I want to share. One, the Federal Court is the most conservative judicial body in Canada. For that court to rule against the government shows just how far this government went. Two, we were able to win this case in large part because of the overwhelming display of community support. "Decisions are not made in a vacuum," Jackman said. The government's banning of Galloway sparked outrage and condemnation - and that made a huge difference. Three - and most importantly - Jackman reminded us of the larger context behind this case. The "membership clause" - section 34 of IRPA, the anti-terrorism clause - is used to criminalize dissent. Anyone who is a member of a terrorist organization is inadmissible to Canada, but the government defines "membership" with a broad, sweeping brush, and through its own ideological lens. Jackman said, "Huge numbers of refugees have been deported back to torture" because they support popular movements in their countries of origins, and these movements have been labelled terrorist organizations by Canada. The membership clause was brought in under a previous Liberal government, and used in a sweeping and abusive way by this Conservative government. Jackman and others have been trying - so far unsuccessfully - to get the clause struck down. But when the government used this clause against George Galloway, they went too far. This decision was the first ever to narrow section 34. Jackman reminded us that the people this clause usually affects are from immigrant communities that have been racialized and marginalized. They can't vote. They need good people of conscience who can vote to speak for them. Next, Jamine Aponte, the partner of war resister Phil McDowell, spoke briefly about the C-440 vote, appealing to the crowd to support war resisters, to contact Michael Ignatieff and other Liberal MPs, and to help her and all the war resisters stay in Canada. Galloway greeted and thanked some of the war resisters. Then, after a few more brief remarks by organizers, Galloway addressed the cheering crowd. He thanked all the key people in this fight and all the good people of Canada. He thanked Justice Richard Mosley for issuing "the soundest judicial caning of a government minister" ever to be handed down from the bench. And now, when we get to the really good stuff, I have to leave you in the good hands of Rabble TV. When I wrote about the Galloway court hearing (parts one, two and three), I mentioned that I have copies of the documents that were submitted by our side, including the appendix outlining the e-mail exchange begun by CIC flak Alykhan Velshi - evidence that the government first concealed, then accidentally released to our side, then tried to have excluded from the proceedings. At that time, I said I would upload those documents for anyone who wanted to read them, then I never followed up. Should I post them? Anyone interested? This was originally supposed to appear at The Mark, as part of a series called "Who Owns Canada?" I ran into a few editorial snags, so I'm posting it here instead. The Mark asked for short pieces answering the question, "Who Owns Canada? Which person, organization, or idea wields more influence than any other?" When The Mark asked "Who owns Canada?" I immediately considered the question in reverse: "Who doesn't own Canada?" The answer: Canadians. A democracy should reflect the will of the people, but current Canadian policy reflects only the will of the Conservative government and its supporters. A majority of Canadians did not vote for Stephen Harper's Conservatives. Yet we are held hostage to his anti-democratic agenda because he has so successfully exploited an antiquated, first-past-the-post electoral system and a pitifully weak opposition. The majority of Canadians do not support the war in Afghanistan, but the Harper government extended Canada's military involvement past its original deadline and hints at continuing it even after next year's planned withdrawal date. Canadians want fairness in all things, including the treatment of immigrants, war resisters and refugee claimants. The Harper government continues to defy two motions passed in Parliament by harassing and deporting US war resisters. It has interfered in the process of the supposedly independent Immigration and Refugee Board and demanded that immigration officials conform to government ideology. Fairness is, at bottom, the reason Canadians want to retain the long-form census – so this country’s policies reflect reality, not ideology. Fairness is why Canadians want a fully funded court-challenges program, so that all Canadians can defend their Charter rights. Fairness is why Canadians want the government to repatriate and defend all Canadians – including those accused of terrorism and those on death row in every country. And while it's not a life-or-death issue, the government denying a Member of the British Parliament entry into Canada because of his political opinions is not only unfair – it's downright embarrassing. Canadians care about their country's standing abroad. By aligning Canada with US military policies, and by putting corporate oil interests ahead of action on climate change, the Harper government has sullied Canada's international reputation and tainted the country's moral authority. And it could be much worse: if Stephen Harper had been Prime Minister in 2003, Canadian soldiers would have been dying in Iraq for the last seven years. Canadians want to live in a democracy – a real democracy. They don't want the Prime Minister to shut down Parliament to avoid losing power, to fire civil servants whose politics he doesn't like, to instruct MPs on how to disrupt Parliament, and to refuse to open the military record to the highest elected body in the land. They don't want dissent criminalized by pre-emptive arrests, jailing of peaceful protesters and tactics more suited to a police state than "the True North strong and free". Stephen Harper’s Conservatives have hijacked this country and we want it back. george galloway in toronto today and tomorrow! Today, join a welcome rally for international peace activist George Galloway at Toronto's Pearson Airport. Tomorrow, hear Galloway speak at Trinity St. Paul's church. Galloway's talk will be "From Gaza to Afghanistan - Resisting war, occupation and censorship". He'll also meet and honour US Iraq War resisters on stage. Saturday, October 2, 5:00 p.m.
Sunday, October 3, 3:00 p.m. Seating will be very limited! The Globe and Mail headline put it best: "‘I'm coming to get you,’ George Galloway tells Jason Kenney". Galloway arrives in Toronto Saturday, and will speak at Trinity St Paul's United Church the following day, Sunday, October 3, at 3:00 p.m. It will be quite a triumphant scene! We sure could use that right now. The media is trying to sell this as a defeat for Galloway and his supporters. It is anything but. Toronto – Federal Court Judge Richard Mosley issued a 60-page ruling today that slams the federal government for attempting to ban former British MP George Galloway from entering Canada. The ruling vindicates Galloway and his Canadian supporters who argued that Minister of Citizenship and Immigration Jason Kenney made a political decision to try to keep Galloway out of Canada, not one based on national security claims. Galloway’s Canadian supporters are claiming victory. Galloway and his supporters will announce in the coming days the details of an upcoming speaking tour that will bring Galloway back to Canada. The bulk on the 60-page ruling, by the way, is a sharp criticism of the government's role in trying to ban Galloway. The judge agreed with us that the ONLY motivation to keep Galloway out was a political one: the government tried to ban someone it disagreed with. Welcome to free speech, Harper-style. The decision also vindicates Galloway by stating in no uncertain terms that the government went too far in trying to label Galloway a terror support. The court said definitively: humanitarian aid is NOT support for terror. Galloway's aid to Gaza is just, fair and legal. This case will have lots of legal repercussions on many fronts, all good for the movement. After I left, the government's counsel continued to hammer away on case law, intending to prove that there is a mountain of legal precedent for interpreting Section 34 of IRPA - the anti-terrorism section - so broadly that George Galloway's donation to Hamas renders him inadmissible to Canada. She also elaborated on the argument that CIC Minister Jason Kenney and Communications Director Alykhan Velshi do not speak for the government. Government counsel characterized Kenney's and Velshi's comments as "ill-advised," "regrettable" and "unfortunate". They claimed that no matter how much rhetoric is thrown around, decisions of admissibility are rendered independently. Thus, because Galloway never arrived at the border, no decision was made. Next, lawyer Barbara Jackman deftly demolished the government's case. Jackman herself had represented many of the people cited in the government's argument. She had argued their cases in federal court - and won many of them - so she knows these cases inside-out. She proceeded to demonstrate how the details of those earlier cases were not congruent with the facts of Galloway's case. In each earlier case, donating money to a "listed organization" was only one of several criteria used to prove membership. People had recruited members, had been paid for work, and in general had engaged in several other activities that could be taken to demonstrate membership status. In each case, there were four or five criteria, which taken as a whole, were deemed to represent membership. Not one case for inadmissibility based on membership in a terrorist organization was proven solely on the basis of someone having donated funds. In other words, there is no way that Galloway's cash donation constituted "membership" in Hamas. In addition, Jackman said it was absurd to claim that because Galloway did not have absolute certainty that his donation would be used for humanitarian aid, that therefore he might have been donating to terrorist activities. The Canadian government, said Jackman, gives foreign aid money to some governments who later use the funds for personal enrichment or other corruption. Can the government demand that individuals seeking entry to Canada have a higher level of oversight and control over their donations than our own government? The lion's share of Galloway's donations were in goods: vehicles, medical supplies, toys, clothes, food, all given to Red Crescent for distribution. And the Red Crescent itself may channel supplies and donations through Hamas. Is it, too, a terrorist organization? The Gazan Ministry of Health has confirmed how Galloway's cash donation was used: to purchase incubators and a pediatric dialysis machine, and to help build a pediatric health unit. The government's counsel acknowledged this. Jackman argued that it's absurd to claim that because, in theory, Hamas could have used Galloway's humanitarian aid for anything, that therefore he donated money to a terrorist organization, and is there a member of a terrorist organization. Jackman also demonstrated that the claim that border guards make independent assessments of admissibility, separate from any direction or pronouncements from the Ministry, is utter nonsense. The guards are employees of the Ministry. They are not some quasi-judicial tribunal that issues their own determinations in a vacuum. The documents we were never meant to see make it exceedingly clear that the government did everything it could to ensure that Galloway wouldn't be "waved in" (as they put it) to Canada. They sent his file. They sent photos. They issued an advisory so that when Galloway's passport was swiped, it would trigger an alert. (Sounds familiar...) In short, they wanted a guarantee from the border guards that Galloway wouldn't be allowed in the country. Jackman also pointed out how the government's reasons for banning Galloway changed over time. At first, the statements coming from the CIC were about "George Galloway said..." or "George Galloway has advocated...". Meaning, he is inadmissible to Canada because of his ideas and his speech. As the media and public backlash grew over this blatant abuse of power and infringement of Charter rights, the government created two new excuses. One, no decision was made, the CBSA letter was merely a preliminary assessment. And two, Galloway was inadmissible to Canada under section 34 of IRPA, giving material support to a listed terrorist organization. The backpedaling and the after-the-fact excuses should tell us something. Now that the hearing is over, legal briefs can be released, so I'll soon have the Galloway team's factum and summary of their case. I'll read the documents this weekend, and if I find anything of particular interest, I will definitely let you know. I can also upload the documents so you can read them yourself. The government's lawyer opened with an anecdote and an analogy. On her way to court, she saw a copy of Maclean's with a picture of the recently famous Iceland volcano on the cover. She said that blaming the Canadian government for the ban of George Galloway is like blaming European air-traffic controllers for the grounded planes. The closures were because of the volcano, and the ban of George Galloway was caused solely by the actions of Galloway himself. Galloway donated money and goods to Hamas, and Galloway himself chose not to visit Canada. After this embarrassing attempt at analogy, the CIC lawyer tackled the "no decision was made" argument, claiming the letter from CBSA to Galloway's office were merely informative. It did not deny him entry. Galloway himself chose not to attempt to cross the border. CIC Lawyer: He could have asked for a Temporary Resident Permit. Judge: Those are given at the discretion of the Minister, who had already indicated that Mr Galloway wouldn't receive one. Judge: --and run the risk of indefinite detention. That's not much of an option, is it? Judge: --Short of showing up and being detained, what options did Mr Galloway have? Once receiving the CBSA letter, how did he have any option of a review or a challenge to this decision? "This is the aspect of this case that troubles me the most." CIC Lawyer replied that any person who does not require a visa to enter Canada (which includes Galloway) can only seek admission at a port of entry. That's where admissibility or inadmissibility is determined. Because Galloway didn't show up at the border, there was no inadmissibility. It was his choice. Judge: "So you're saying the counsel for George Galloway jumped the gun?" Despite receiving a letter warning them about inadmissability, they merely assumed inadmissibility? Judge: "Was it in good faith? Or was it because the leader of the Canadian government was about to visit the UK and they were trying to save Canada some embarrassment? The British press would have had a field day." CICL: They had a field day anyway, so you see, that didn't work. CICL then tries to say that when George Galloway was leading the Viva Palestina convoy, he knew that this would make him inadmissible to Canada. Judge: Do you really think that while Mr Galloway was taking 109 trucks from Europe to Gaza and giving money to Hamas, he was considering the reactions of the Canadian government? We were all trying not to laugh out loud. Judge: And they didn't. All those countries have anti-terrorism laws and none of them took action against Mr Galloway. CICL: Yes, and that's their decision, but under Canada's laws, Mr Galloway is inadmissible because he donated money through Hamas. The Judge pointed out that Galloway only gave humanitarian aid. CICL said it doesn't matter, because it went through Hamas. Judge: "So you're saying that if anyone sends aid to Palestine they are inadmissible to Canada?" CICL: No, not if the aid goes through the Red Crescent. Only if it goes through Hamas. Judge: "So the moment you give one dollar to the widows and orphans in Gaza through Hamas, you are a member of a terrorist organization?" Sitting next to me, NCF said, "I'm almost starting to feel sorry for her." At this point, CICL said she would leave her current arguments to the written submissions and jump ahead to clarify the definition of a terrorist and "a member of a terrorist organization" under section 34 of the Immigration and Refugee Protection Act (IRPA). First CICL sought to clarify the legal definition of the word "member". The words "devotes full-time or nearly full-time work" came first, and the judge again interrupted. Judge: "I don't know or care what Mr Galloway does with his time, but he is a sitting member of the British Parliament, so presumably one could hardly say he meets this definition." CICL backed down, and cited case law where someone who had given money to an organization deemed to be a terrorist group had been found to be a member of that group. The case involved the LTTE, the Tamil organization. Judge: But Mr Galloway gave money for medical supplies, and evidence shows the money was used for medical supplies. CICL: But Mr Galloway had no assurance that the money would be used that way. Once he handed the money over, he had no control over it. It was used for medical supplies, but it could have been used for militant purposes. Judge: Mr Galloway says he is not a member of Hamas. He says he supports Fatah. CICL: That is Mr Galloway's own statement. He can make that claim, but he can't dictate Canadian law. This is when it got tricky. There were a lot of these cases, and the judge stopped interrupting, and let her pile up her precedents. So it's conceivable that under these elastic definitions of "member of a terrorist organization," George Galloway could be found inadmissible to Canada. But the people in the cited cases were all brown, with foreign-sounding last names and no status. I have trouble believing that a Canadian court will find a white, Scottish-born Member of the Parliament of the United Kingdom to be a member of a terrorist organization because he gave humanitarian aid to an elected government. But of course none of us know what the outcome will be. I can only hope that Mr. Justice Mosley will find in favour of Charter rights, of free speech, of freedom of association and of sanity, and against the arbitrary imposition of Jason Kenney's personal opinions on the rest of us. Update: I've just spoken to James Clark, a principal organizer of the Galloway tour, who was in court for the hearing. I have a summary of what I missed, as well as court documents that can now be made public. More soon! This week, I attended the Federal Court hearing reviewing the Canadian government's decision to bar British MP George Galloway from entering the country. I wasn't able to stay til the end, but what I saw was very interesting and sometimes amusing. I've asked a few people about what I missed, so I'll update this later if necessary. The Federal Court agreeing to review this case is itself a victory, and was accomplished through the tireless efforts of Canadian peace activists and defenders of free speech, and likely because the person deemed inadmissible is a Member of the British Parliament. In my opinion, in order to find for the Government - that is, in order to uphold the ban against Galloway - the Federal Court will have to find that a British MP is a member of a terrorist organization. It's the only halfway cogent argument the government has, and I don't believe the court will be willing to do that. I may well be wrong - no one knows what will happen in any court case - but that's my assessment, based on what I heard. Here are some details. The government's case defending the decision to bar Galloway from Canada has four parts. 1. No decision was actually made as to Galloway's inadmissibility. The information sent from the CIC to the CBSA was merely a recommendation, and the letter Galloway received was merely a heads-up that he might have trouble at the border. Only a border guard determines admissibility. Galloway himself decided not to arrive at the border. It was his decision. 2. When Alykhan Velshi, director of communications for the CIC, declared Galloway inadmissible to Canada because he supposedly supports terrorism, Velshi wasn't speaking in any official capacity. Likewise, CIC Minister Jason Kenney's "unfortunate comments" (that's a quote, I swear), were not said in any official capacity. 3. Galloway's supporters and the organizers of his tour have no standing to bring suit in this case. Their rights were not infringed. Only Galloway has standing to bring this suit. 4. 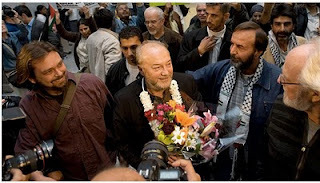 Because Galloway donated money for humanitarian aid through the Hamas government, he is a member of a terrorist organization, and therefore inadmissible to Canada. In the opening statements, we heard how this whole thing started: with a letter from the right-wing "Jewish Defense League" (I can't write their name without quotes!) to Jason Kenney, alerting him that Galloway was planning to come to Canada and asking Kenney to prevent that from happening. The next day, CIC flack Alykhan Velshi emailed the Canadian Border Services Agency: subject line, "Inadmissible". (You can see these emails here. We have access to them thanks to a government bureaucratic blunder and a positive court decision.) In the span of eight minutes, Galloway is found inadmissible to Canada. Over the next two hours, there are a series of emails between the CIC and the CBSA, discussing how to present this decision to the media and the public. A few days later, Velshi emailed the CBSA, asking them to update border security on Galloway's status, to ensure that a border guard doesn't just "wave him in" to the country. CBSA says they'll use all their resources to make sure Galloway is flagged. CBSA then sends a letter to Galloway's office informing Galloway that he is being deemed inadmissible to Canada. The judge asked, "This was a recommendation. Isn't it possible for the border guard or customs officer to make a different decision?" Lawyers for the Applicants: "It's theoretically possible, but it's very unlikely." Judge: "Couldn't the officer decide for him or herself, at his or her own discretion?" Lawyer: "Perhaps if the officer was retiring in two weeks." Lawyers for our side quoted from the relevant statutes proving that at the port of entry to Canada, guards' decisions are subject to the direction of the Ministry. There was little doubt that despite what the government claims, a decision was made. In addition, they demonstrated very clearly that Galloway's "choice" was between arriving at the border and risking detention (potentially indefinite detention under current anti-terrorism laws), or staying away. That is, not really a choice at all. Next, lawyer Barbara Jackman showed that the organizers of Galloway's tour, as Canadian citizens, do have standing to bring this suit, because their Charter rights were clearly infringed. Jackman walked the court through Galloway's work on behalf of Palestinians, especially the people of Gaza during the siege of that territory - his "Viva Palestina" convoy of 109 trucks delivering food, clothes and medical supplies, as well as £25,000 he donated to buy medical equipment, incubators and other humanitarian aid. She mentioned that 30 British Members of Parliament joined dozens of NGOs and other international organizations in signing a letter urging the lifting of the Gaza blockade. On the other side, Jackman showed Jason Kenney's consistently anti-Palestinian point of view, including funding cuts to the Canadian Arab Federation and KAIROS for supposedly being terrorist and anti-Semitic, respectively, slamming CUPE for calling for a boycott of Israel, and a host of comments in the media and on the floor of the House of Commons. Jackman demolished these arguments, showing how Kenney is himself the decision maker, that officers of his Ministry act on his behalf and under his direction, and that the decision to ban Galloway must be seen in context of this bias. Indeed, as the internal emails say: The good news is we can ban Galloway, the bad news is what are we going to tell the media. If Alykhan Velshi spoke out of turn or usurped authority in making this decision-that-was-not-a-decision, not once did Jason Kenney publicly disavow Velshi's statements. Not once did Kenney distance himself from his staff's remarks. Only now does he try to hide behind Velshi. But the Supreme Court of Canada has ruled more than once that Ministry officials do speak for the Ministry. Jackman even showed that CSIS itself had cleared Galloway for entry into Canada! CSIS had no problem with Galloway, nor did the US. But Jason Kenney had a problem with George Galloway. Many defenders of the government's decision to bar Galloway from Canada say, "He has no right to tell Canada it must admit him." That's true, and Jackman made it clear that she agrees. Galloway can't say "I have a right to enter Canada," but he has a right to expect the law to be applied fairly, and in this case, it was not. Jackman demonstrated at great length that Galloway's actions outside of Canada do not fall under any reasonable definition of terrorism. Galloway's convoy to Gaza was on a peaceful, humantarian mission. He entered Gaza the only way he could have gotten in, with the permission of Israeli authorities. He delivered food, medical aid, toys and other supplies, all of which were approved by Israel. He also delivered aid through the Red Crescent. What the government wants to call terrorism is this: Galloway donated some funds through Hamas, the elected government of the Palestinian Authority. The money was for humanitarian aid, and it was used as such. Many other countries, such as Norway, donated similar aid. Jackman mentioned the Gaza Freedom March, a convoy of 1300 people, including many Canadians (and a few wmtc readers!). Jackman specifically mentioned the support of Canadians Naomi Klein and Sasha Trudeau. Jackman makes a powerful argument that if Galloway's actions are deemed to constitute terrorism, we devalue the entire notion of terrorism. Canada's anti-terror laws were instituted to protect Canadians from violence, not meant to punish unpopular political views or curtail humanitarian aid. Jackman asks, what's the point of having anti-terrorism laws if they apply to peaceful people who are merely saying things the government doesn't like? "Even if we maintain a myth that an officer at a Port of Entry can make a decision different from the Ministry's recommendation," she said, we must not interpret the decision of terrorism so broadly as to forget what terorrism really is. "If we call Mr Galloway a terrorist," she said, "then the word terrorism has no meaning. An incubator is not a gun." Alykhan Velshi has claimed that Galloway "expressed support for Taliban murderers who want to kill Canadian troops". No one can find any record, anywhere, of George Galloway saying such a thing. Galloway has never expressed support for the Taliban, and anyone who is familiar with his ideas finds the idea of him doing so completely ridiculous. However, even if Galloway had said such a thing, his speech is still protected, and he cannot be denied admission to Canada on the basis of his speech. Both Jackman and a lawyer for the Canadian Civil Liberties Association demonstrated at length and incontrovertibly that when Galloway was barred from Canada, the Charter rights of Canadians and Permanent Residents were infringed. The freedoms of speech, expression and association of all of us were most certainly violated. The government claims Galloway was merely denied "a platform". After all, we were able to watch his speech through a video link. We can read his speeches and anything he writes. But the Supreme Court of Canada has ruled very clearly that expression is a two-way street. That our right of free speech is not only the right to speak, but the right to listen, the right to be exposed to ideas. That public meetings, pickets, protest and rallies are fundamental to these rights. That our rights to receive information and ideas, to engage in discussion and debate, are inherent in our rights of freedom of speech, association and assembly. Freedom of expression involves not just our right to speak and to publish, but our right to read, to know, to learn. It involves the "collective actions of individuals in pursuit of a common goals". Our freedom of expression is a process, and the Charter of Rights and Freedoms protects that process. The Supreme Courts of both Canada and the United States have ruled time and again that the existence of alternate technology to bring a person's ideas to listeners does not obviate the listener's right to meet a speaker in person, to hear, to shake hands - to freely associate with whom they choose. Jackman and the CCLA showed that the government cannot recharacterize their ban of Galloway as merely the denial of a "platform" and still claim that Canada has freedom of speech. Of course, there are limits on our freedoms, put in place to protect national security and protect against violence. But there was no threat to national security here. There were only Galloway's views, which are contrary to the views of the Canadian government - and worse, contrary to the views of some individuals in the Canadian government. There are limits to our Charter rights and freedoms, but those limits cannot be applied arbitrarily, and they must always be content-neutral. (Meaning if Ann Coulter is allowed in Canada, Galloway has to be allowed, too.) Declaring someone inadmissible to the country because of the content of a speech is a violation of basic freedoms. Canada has no provision for inadmissibility because of speech or politics, only for actions. Jason Kenney says Galloway was only denied a platform, nothing more. Jackman and the CCLA showed that the government cannot do that, period. According to the CCLA, when the government says, "all that is missing is seeing him in person," we must say, "That's our whole point. We are allowed to see him in person, and you can't deny us that right simply because you don't like his ideas." The CCLA was particularly strong on this point. The ban on Galloway violates the Charter rights of Canadian citizens and permanent residents. The "threat of exposing Canadians to ideas that are unpalatable to the government in power" is not what Parliament had in mind when it passed anti-terrorism laws. Part Two, the government's side, coming soon.